Diocletiane, we want you back! More than seventeen hundred years ago magnificent Gaius Aurelius Valerius Diocletianus decided to build himself a weekend house. He had traveled all over Mediterranean Sea, had seen unnumbered places and had killed uncountable enemies. So he knew exactly where is the best and most beautiful place to put it - in the middle of the Dalmatian coast. Of course the imperial weekend house is more than just a tiny wooden building. After ten years of continuous building, in year 295, a huge and beautiful stone palace, about 200 meters long and wide, arose from the ground - many kings could only wish to have it! After it was finished, Diocletianus lived through his last years right there. Well, even after his death, importance of the palace did not decrease. Its fortification advantages made the palace the last capital of the Western Roman empire as the last two Emperors ruled what was left to be ruled right from there. If you ask a citizen of Split about the great emperor, you will probably hear just a nostalgic sigh. Well, that man built the whole thing in short ten years. And now we find it hard just to renovate it in the same period. . . .
After Avars destroyed near-laying town of Salona, its inhabitants fled to near-by islands. After Avars plundered all that was accessible, they left after a few decades and Salona's citizens returned. However, not much remained of the town, so the only place they could get any shelter was the palace. From this moment on the palace in fact becomes a town of Split. The new Split's surroundings were then populated by Slav tribes. During long time of period they have been mixing with town's population and brought a new strange culture. The town itself became a medieval cultural center influenced by both old Roman and new Slavic culture. All along Middle ages Split is a center of Croatian culture. Many greatest Croatian artists were born and worked there, among others Marko Marulic, "the father of Croatian literature". Below: Midevial detail from the town. Because of the mixed population, the town often changed its masters: Byzantium empire, the Venice republic or the Croatian kingdom. After 350 years long period of Venetian rule, which was characterized by Ottoman attacks and several plague epidemics, Split was for the short time ruled by Napoleon. From 1814 it is finally a part of the Austrian empire and consequently a part of the Croatian province of Dalmatia. From 1882, the municipal corporation was transferred to Croatian hands and so remains ever since, with an exception during the Second World War. During all these periods, different styles gave Split a special appearance. Despite styles mix, they coexistent perfectly. From the Roman wall to neoclassic Austrian buildings, everything has found place in this small place of land next to the blue sea and under the Mediterranean sun. Split has the perfect geographic position. Because of high mountains on the north and numerous, beautiful islands on the south, it is protected from strong winds and high waves. Lying by the sea, it has a very temperate climate, with mild, humid winters and hot arid summers. The vegetation is subtropic. Split today is the second largest Croatian city and a cultural, educational and administration center with the University. It is also the largest Croatian coastal city and the center of the Dalmatian region. Because of the intersection of different coastal routes and numerous island laying near by, it is the most important passenger port on the Adriatic sea. After it was connected with inland by railroad in 1925, it started to develop into an industrial city. The most important industrial branches are ship-building and cement production. The population is about 200.000 inhabitants. 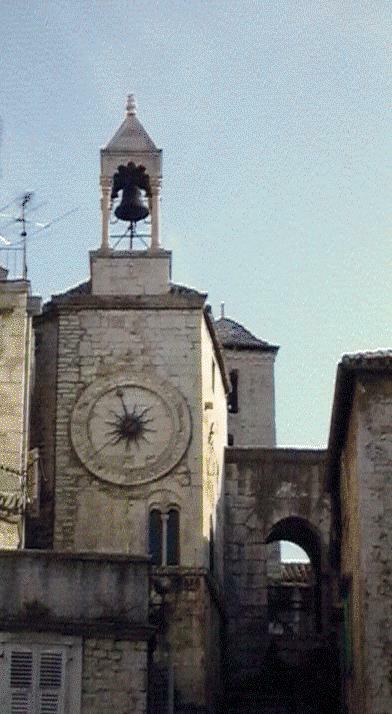 Split is of course the city of many museums in which the long history of town and surrounding is saved. The center itself is protected by UNESCO charter as the world heritage. Additionally, the near-lying town of Salona is the most important archaeologic location of the later Roman period. One of the worst things that might happen to a man is to be born in Split without any musical talent. The town gave best Croatian composers: Jakov Gotovac wrote the most popular Croatian opera "Ero sa onoga svijeta". Melodies from operettas "Splitski akvarel" i "Mala Floramye", written by composer Ivo Tijardovic describes every street and every corner of the town. In Split was also born Franz von Suppe, one of the most important representatives of the Vienna operetta. Yes, and even the author of this home-page writes a composition from time to time. . . . So there is no wonder that one of the most important institutions in Split is the Opera house. The Opera choir is traditionally the best professional choir in Croatia. The Split Opera festival was before the war the most important festival of that kind. 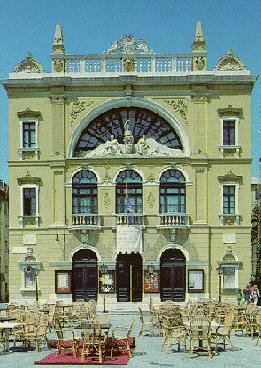 Below: Croatian National Theater in Split. 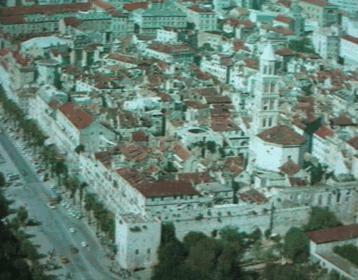 Megalomanic socialistic development of the city in past times left on Split's appearance many nasty scars. However, the municipal corporation started many projects, which will remove them and turn Split in primarily tourist center and lead in into the 21st century. 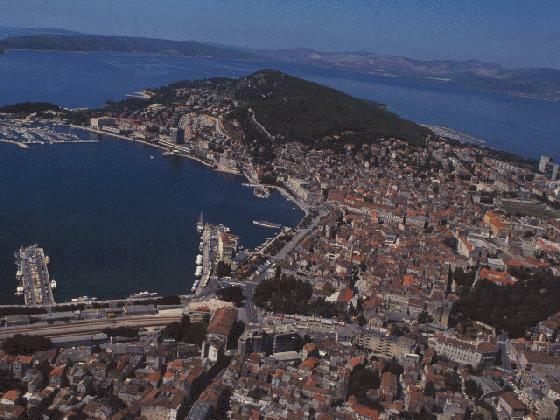 The first project is ecological revitalization of Kastela bay. In next five years new-build canalization net will turn Kastela bay back to one of the most beautiful Mediterranean bays. This year also started integral reconstruction of Diocletian's palace, which will last for the next ten years. The specially interesting segment is excavating the cellars of the palace, which were buried during the middle age with the city's garbage. Most of the cellars are already excavated and open for visitors. Well, isn't this city something? And you have not seen it yet? No?! Well, then, come and wish it happy birthday. Until then, so long!